Trekking Tour is the only private tour to make combination between grotourism and culture with orientation and motto "Back to nature"
We organized the memorable jungle trekking tours of Bali, especially trekking tour to the attractive hideaway around amazing Batur Volcano with Beautiful Sunrise,amazing jungle of Tamblingan lake with unique old temples inside, Sambangan Village with seven wonderful waterfalls and to the rain forest of Gobleg, Munduk,Gesing, & Umejero village which now well-known as Catur Desa meaning of Association of four oldest village in Bali .Gobleg & Munduk village has four wonderful waterfalls. With our local trained Guide we will offer you with the real Bali Nature Experiences. Join us for a sunrise trek to the summit of Mt.Batur (1717 meters) . Munduk is the name of a quiet village situated on a hill road surrounded by breathtaking views. 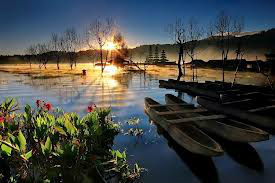 It is situated at about 1500 meters above sea level, in the northern part of Bali, Buleleng. SAMBANGAN VILLAGE is located in North Bali-District Sukasada, Buleleng regency. It's about 20 minutes driving from Lovina Beach (The most famous beach in Singaraja) or 2.5 hours from Ngurah Rai Airport (Denpasar) to reach the village. Country Region Sambangan predominately a retreat area that borders the rice paddies,Water Falls and protected forests in the upstream (south side of the village). Country topography is varied enough Sambangan. Bottom of the territory (north) relatively flat country, while in some other locations, such as in the surrounding mountains bordering the Wanagiri Desa (village south Sambangan), relative regional steep slopes with slope greater than 40%. Height in the region reach around 500m - 1.020m above sea level (above sea level). While some regions in the Village Wanagiri can even reach a height of 1.350m above sea level (Digital terrain map of Indonesia, 1999). Based on the results recorded on the Yellow Temple Station, the amonthly air temperature ranges from Country Sambangan 100 C and 140 C, while the maximum monthly temperatures range between 21 C and 25 C.
re Our More then 10 Waterfall in North of Bali. DURING THE TOUR YOU ALSO WILL TASTE THE LOCAL FRUIT FROM OUR VILLAGE SUCH AS STRAWBERRY, ORANGE,SNAKE FRUIT, PASSION FRUIT, BANANA AND WE ALSO WILL SERVE YOU WITH COFFEE OR TEA DURING YOU EXPLORING TAMBLINGAN LAKE BY OUR DUGOUT CANOE.